parting shot "Parting Shot'' is a monthly opinion column written on a rotating basis by guest authors. The opinions expressed are not necessarily those of FE&S. Navigating Local Ordinances for Waste Management Michael Keleman Manager of Environmental Engineering InSinkErator Racine, Wis. Michael.keleman@emerson.com W ith ve states now either establishing diversion goals for food waste diversion from landlls or outright banning commercial food waste from landlls, restaurant operators and suppliers are sometimes curious about what options are allowed in their jurisdiction. Foodservice establishments may also voluntarily look for alternatives to landlling their or- ganic waste. Either way, they often inquire whether their jurisdiction allows disposers or pulpers. Knowing which authority has jurisdic- tion over such matters represents the rst, and sometimes most perplexing, issue. It might be a city or town, or it could be the county that has jurisdiction. In addition, sometimes the local health department decides what equipment a foodservice op- erator can use. Other times the local sewer use ordinance established by the wastewa- ter utility may have precedence. In most cases municipal websites list a city depart- ment as the wastewater authority. In other cases, the wastewater utility may exist as a sanitary board, commission or simply as the wastewater authority. In a few specialized instances, a state or county law might supersede all consid- erations. For example, the Massachusetts State Plumbing Code (248 CMR 10.10 (8) d.) requires all foodservice establish- ments serving 20 or more patrons to have a commercial disposer. In Washington, D.C., the Health Department established rule 2607.2, which states, "… each food establishment served by a sanitary sewer and conducting any activity or activities which generate food wastes shall have and use one (1) or more commercial food waste grinders." Finding the actual ordinance is often only one click away. Most major munici- palities and county governments pub- lish an electronic version of their codes. Simply start with an internet search for a city or county's code and that will link you to the most recently codied version of local regulations. Then search for key words, such as grinder, disposer or pulper, to quickly nd if a particular jurisdiction mandates their use. Even though the perception is that sometimes disposers and pulpers are not allowed in commercial establishments, most municipal codes are absent of lan- guage on this equipment. Occasionally, during the design or construction phase of a foodservice establishment, people are in- formed they are not allowed to have these appliances. If a code search does not yield a specic restriction or prohibition, design- ers, consultants and sales representatives should request what regulation prevents the installation. Without a specic written regulation, prohibiting disposers and pulp- ers has no legal basis. 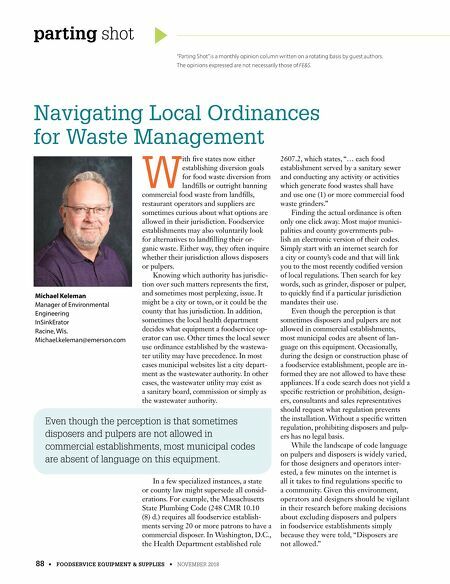 While the landscape of code language on pulpers and disposers is widely varied, for those designers and operators inter- ested, a few minutes on the internet is all it takes to nd regulations specic to a community. Given this environment, operators and designers should be vigilant in their research before making decisions about excluding disposers and pulpers in foodservice establishments simply because they were told, "Disposers are not allowed." 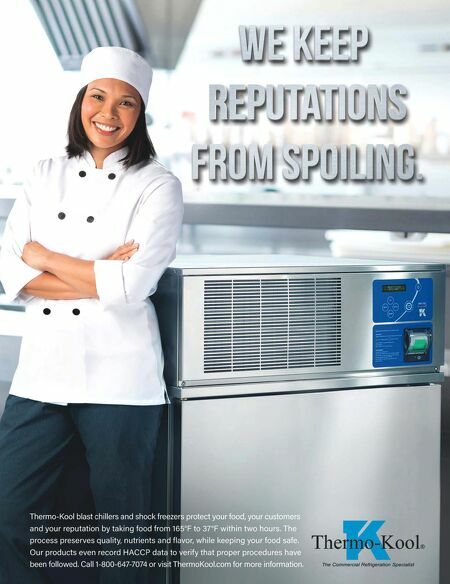 88 • FOODSERVICE EQUIPMENT & SUPPLIES • NOVEMBER 2018 Even though the perception is that sometimes disposers and pulpers are not allowed in commercial establishments, most municipal codes are absent of language on this equipment.